Tempter -- During the 2012 TLMA Expo measuring Tempter was the second largest horn base of all bulls measured in OKC and all satellites. 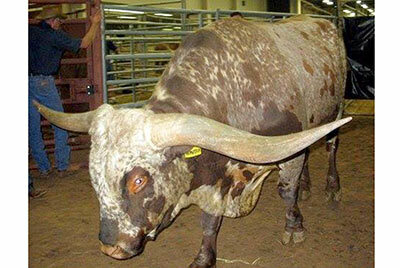 He is over 85" T2T today and still one of the largest base bulls. As larger horn is developed don't be shocked when the horn bases also increase. A few sweet Tempter daughters are for sale at the DCCI inventory. check it. www.texaslonghorn.com. He was defeated for most base by DCCI's Clear Win. What the hey! !